IMAGINE a life where money is no object. For those lucky few, this is a reality. And for Mercedes-Benz, they'll find about 100 Australians in this realm during 2015 looking for something with sporting bent, combined with exclusivity and pure luxury. 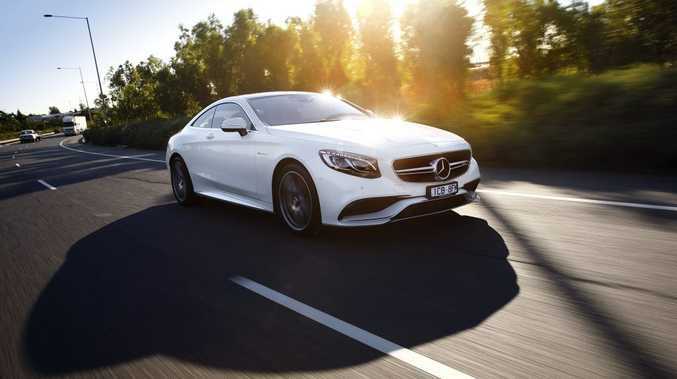 The S-Class Coupe is back, gone is the CL-Class nomenclature, Mercedes has returned to its long history of luxury two-doors wearing the "S" badge. For now the S63 is the only one here with a sticker price of $409,000 plus on-roads, while the $319,000 S500 and a $499,000 V12-powered S65 are expected to touch down mid-year. The instrumentation itself is something to behold. Two 30cm colour screens, one dedicated to standard gauges (including a large speedometer and tacho, along with oil and engine temperature). Given velocity generated by the S63 it's handy to have a trio of speedos, one in an analogue gauge, another digital option within the cluster and a third in the head-up display. Cabin finishes are exemplary. Fine leather trim (double stitched) covers nearly all aspects of the shapely dash. Both front pews are akin to lounge chairs. Sumptuous yet supportive at the thighs and ribs they make you look forward to a long journey. They have all your usual fore and aft electric adjustment, along with an ability to add additional support at the lumbar, shoulder, side rests, but can also give you a massage of your choice - choose between a hot shoulders or back treatment, or maybe the activating, classic or mobilising options take your fancy. There is an airy and spacious feel to the cabin, mostly courtesy of the extended sunroof which is more than one square metre in size. Outstanding. The big Benz coupe defies logic and gravity. 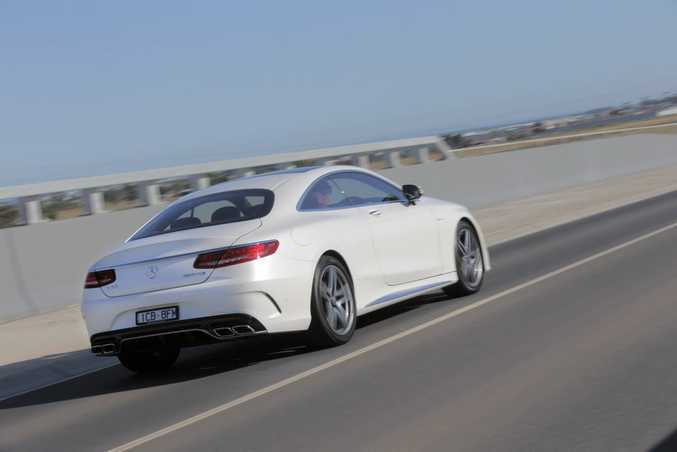 Launching with a growl and a snigger from the exhaust, the S63 is far from outlandish - unlike some of its smaller AMG stablemates like the upstart A45 hatch. When cruising it hardly breaths, slipping through the seven-speed gearbox like silk. Yet it takes little encouragement to unleash the beast within. With the flat-bottom steering wheel in hand, and making use of the paddles, the driver can pull a gear and make full use of the monstrous torque on tap. Steering is light, depending on mode, and it feels remarkably deft for its size. This variant has dropped weight - it's been fed a front-end diet of aluminium along with a range of other initiatives that have shed 65kg over the previous variant. Yet most impressive is the Magic Body Control with Curve Titling function. Designed to lean into bends like a motorcyclist or skier, it uses cameras to analyse the curvature of the road up to 15 metres ahead. Active hydraulics prop up the car where it's needed to keep the vehicle on a constant plane … it's an interesting experience especially when tackling a corner with enthusiasm. Body roll is virtually non-existent. And it's quick too. 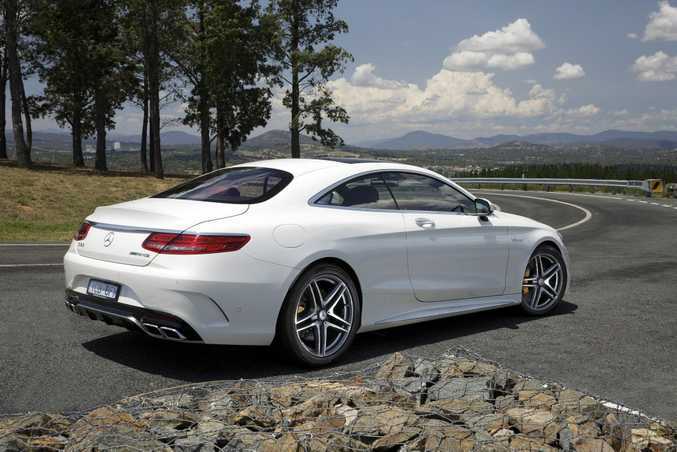 This variant is only 0.1 seconds behind the S65 in the 0-100kmh sprint with a time of 4.2 seconds. When you're flexing its muscle the soundtrack is relatively subdued courtesy of the outstanding acoustics. We'd recommend windows down when exploring the rev range. Given its 400k-plus price tag, there is no surprise an array of kit accompanies your investment. 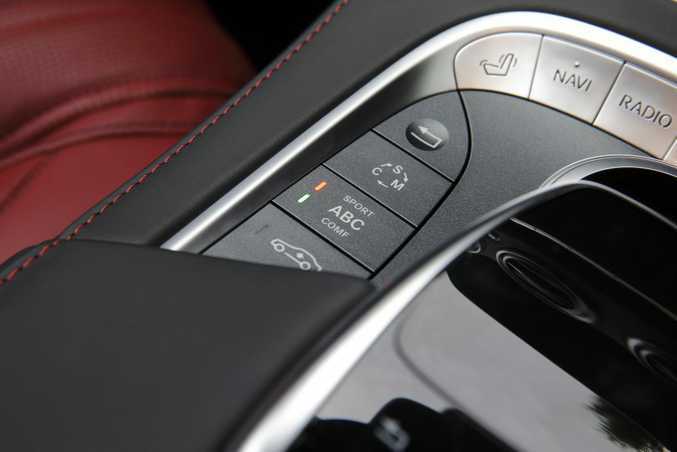 While there is still a long list of options to personalise your coupe, it comes with 20-inch five-spoke alloys, 13-speaker Burmester sound system, nappa leather, sports seats and steering wheel, 3D sat nav, electric blind for the back window, massive sunroof, two-zone climate control and full Bluetooth connectivity. All the outstanding safety kit is also included, like radar cruise control, eight airbags, technology which helps maintain total control in cross winds and drowsiness detection. When you've parted with this kind of money, who cares what it costs to operate? Consumption is pretty good, down to 10.2 litres/100km which is less than the previous iteration despite the power increases. Owners can expect large sums for insurance and servicing, while the 20-inch rubber will be about a grand for each corner. Dual cup holders are beautifully tucked away, hidden behind a glossy door in the console. A large console bin is accessed by an awkward wide top hinged on the right side - not the usual Mercedes dual door function. While wearing the 'S' badging, the coupe doesn't have the same expansive cabin space as its sedan sibling. Rear seat space can be tight for those long and lanky, with leg room dependent on the generosity of front seat passengers. Yet boot space is impressive. It will easily swallow a pair of large suitcases, and of course the lid has an electric opening and closing function. Pulling into the metropolitan traffic my colleague and I were waxing lyrical that the S63 manages to keep a low profile … it doesn't shout about its ability with big wings or Tupperware hanging off at all angles. Then came the bloke with his phone at the ready snapping pics, a P-plated young gal stopped 20 metres short of the lights just to get a better look and then a tradie in a ute wound down the window to ask whether he could work for us. It generates respect from those who know quality. The long bonnet with pronounced lines and powerdomes, along with the now trademark high beltline in profile make for a car resonating presence and prestige. No AMG would be complete without sporting regalia, and the S63 doesn't disappoint with the big alloys and full body kit. Few things in life are perfect. The Mercedes-Benz S63 AMG is mighty close. Although, it comes at a price. It's hard to escape the fact that just the luxury car tax paid on the S63 is enough to secure a pint-size A45 AMG - but don't get us started on this ridiculous government fundraiser. The cabin finishes, the drive experience, it's a beautifully refined offering. What we liked: Majestic and brutal, brilliant dash finish, curve control function. What we'd like to see: Ability to hear more of the V8 soundtrack, extra legroom in the back. Warranty and servicing: Three-year unlimited kilometre warranty. Servicing is at 25,000km or annually. There are up-front servicing plans, which covers between 2-5 years and 50-125,000km. 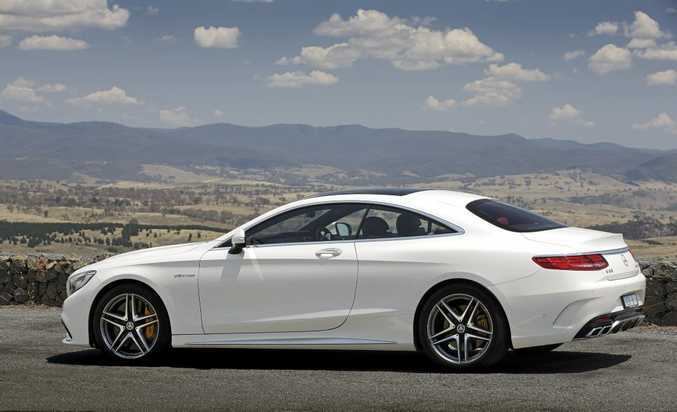 Model: Mercedes-Benz S63 AMG Coupe. Details: Two-door four-seat rear-wheel drive luxury performance coupe. Engine: 5.5-liitre bi-turbo V8 generating maximum power of 430kW @ 5500rpm and peak torque of 900Nm @ 2250-3750rpm. Consumption: 10.2 litres/100km (combined average). Performance: 0-100kmh in 4.2 seconds; top speed 210kmh. Bottom line plus on-roads: $409,000.